Infinix has just launched its llatest addition to its S Series, the Infinix S4. The Infinix S4 continues to focus on the selfies camera and Infinix has been teasing about it, well, now it’s finally here. Speaking during the launch, Livingston Migwi – Transsion Business Development Manager noted how the Infinx brand has grown not only in Africa but in East Asia and in the Middle East operating in Nigeria, East Africa, Indonesia and in Dubai, UAE. 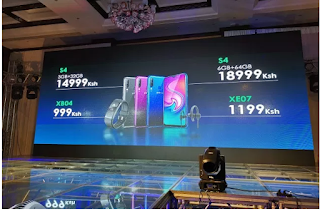 He also announced that they just launched an Infinix concept store in Morocco, aptly named Infinix Spark where staff, partners and customers will get to experience Infinix current and new products. The S series by Infinix is focused on the selfie taking audience and it’s other specs will shake up the very competitive budget category dominating the Kenyan smartphone market. The Infinix S4 runs on XOS v5.0 Cheetah on top of Android 9.0 Pie which is a first for InfinxI. On the Infinix S4, we either get 3 GB or 6GB of RAM so expect fast performance by the MediaTek Helio P22 processor coupled with 32GB or 64 GB of onboard storage expandable to 128GB via a microSD. Let’s shift to the optics the Infinix S4 packs. There’s a triple rear camera set-up that features a 13MP, an 8MP and a 2MP wide angle sensor aligned vertically next to the quad LED flash. On the front you get, a 32MP AI-powered selfie camera. Camera modes include Portrait mode, panorama, auto HDR among others which we’ll get to lay around for our first impression and full review. A 4000mAh battery Powers up the Infinix S4. The phone comes in a variety of colors including Milan Black, Blue and Purple. Where can I get the Infinix S4 and for how much? The Infinix S4 can be found on Infinix’s e-commerce site, Infinix Mall for N45,000 for the 3GB and 32GB storage variant and NGN60,000 for the 6GB RAM and 64GB storage variant. Other retailing partners include Jumia, Kilimall, and other physical stores. Lipalater is also available with pocket friendly financing options. Pre-orders go live from today till the 22nd of April.